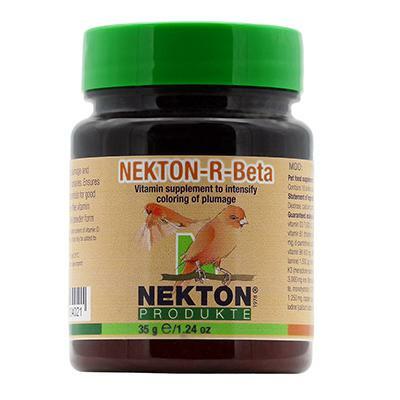 NEKTON-R-Beta contains all essential vitamins, amino acids, minerals, the colorant beta-carotene and trace elements in balanced proportions. NEKTON-R-Beta prevents feather colors from fading and positively influences the natural shine and brightness of the whole plumage. Due to the vitamin complex contained within, the bird is supported through the entire molting/rearing process and additionally supplied with all important nutrients. NEKTON-R-BETA contains a high amount of the highly effective colorant beta carotene, which is found in nature. 1 g (1 level measuring spoon) NEKTON-R- Beta to 250 ml (8.5 oz.) water or 100 g (3.4 oz. )soft food. Apply only during the plumage growth. NEKTON-R-Beta should be stored dry and out of sunlight, between 15° and 25° C (59° and 77° F). DO NOT STORE IN THE FRIDGE !! !